In this paper I shall particularly investigate the transdisciplinary impact of science on the poetics of three post-war artists, Lucio Fontana, Toti Scialoja and Amelia Rosselli. I shall specifically focus on the epistemological concept of space-time and propose it as illustrative of such influence, following Eco’s intuition that a work of art functions as an «epistemological metaphor» and it stands for a cultural way of understanding the world. Eco’s new form of criticism, presented in his influential work Opera aperta (1962), furthermore justifies an interdisciplinary comparison; even though Fontana was a visual artist, Scialoja a painter and poet and Rosselli a poet, they all shared a particular interest for matters of space, which became a highly distinctive trait in their poetics. The space they were drawn to ceased to be that of Euclidean geometry and embraced non-Euclidean systems; it was an Einsteinian space energized and brought to dynamism by the fourth dimension of time. The word ‘tetradimensional’, as a matter of fact, became an active and pivotal term in the shaping of these three artists’ poetics, showing how the artistic process can be read as a complex result of heterogeneous and shared cultural stimuli. Under this perspective, it is possible to interdisciplinary compare their work, thus catching a glimpse of what lays hidden beyond the artistic artefact, being it painting, writing or any other art form. And what lays hidden beyond the artwork is deeply intertwined with the cultural context in which artists lived and created their own art. Interestingly, the decade of the 1950’s was a time of opening up to new horizons. After realism, and neorealism in cinema and literature, had mostly proved to anchor to a national, or more specifically ‘southern’, dimension, a quest for a type of art disentangled from political interferences made its way. Deemed to be populistic and rhetorical, realism was gradually rejected and the field was thus made clear for an unbiased research on forms and models. The creative turmoil manifested itself in the emergence of remarkably active cultural and artistic clusters, with radial points in Milan, Rome, Naples and Venice. Rome, in particular, became an avant-garde centre of cross-contamination, lively and unwearied. It was the city of Fellini, Moravia, Rosselli, Scialoja and it attracted artists from all over Europe and America. In Rome, in 1953, Leonardo Sinisgalli, also referred to as the ‘poet-engineer’, started publishing Civiltà delle Macchine, which closely focused on the relationship between art, culture, science and technology. Milan was an equally vibrant centre, home of the Spatialist and of the Nuclear artistic movements; here, in 1951, philosopher Enzo Paci and art critic Gillo Dorfles founded Aut-Aut; a couple of years later in 1955, artist Enrico Baj created the magazine Il gesto, which published works both from visual artists, such as Lucio Fontana, Enrico Baj himself, Jean Dubuffet, and from experimental writers like Edoardo Sanguineti and Nanni Balestrini. In 1956, furthermore, Luciano Anceschi gave life to il verri, which became the cultural point of reference for the Neo-avantgarde movement and for Gruppo 63. The foundation of so many different journals was a clear sign of intellectual liveliness and it expressed the wish to broaden the field of discussion. Among the new publications Aut-Aut, a highly influential periodical characterized by a versatile and interdisciplinary editorial line, particularly illustrates how science had progressively caught the interest of several Italian thinkers and artists. Since its very first issue, the magazine warmly encouraged a comparison between different art forms, it discussed the latest philosophical debates and it called the attention to the changes in paradigm occurred at the beginning of the century. Particularly interesting for the discussion of the time-space concept is Vittorio Somenzi’s article Relatività e fisica nucleare, in which the author describes the shift of ‘paradigm’ from Newtonian to Einsteinian physics, explaining how such change brought about a «curvature of the time-space continuum, generated by the addition of the time dimension to the three dimensions of traditional space». It was only after 1945 that the space-time revolution finally took place. The end of Second World War forced people to surrender to a bewildering and unprecedented obviousness; temporal instants did not flow into a single progressive duration. On the contrary, more durations existed which, in a lack of hierarchy, could multiply; the single temporal line was then divided in a variety of lines, time ‘produced surface’. The perception of historical time was seized by the laws of space-time. It was therefore necessary to wait until 1945 to ascertain that this new conjunction was not a vision abstracted from the universe, but it applied to the time and space of all human beings, in all moments and in all places. This spatial dimension of time was integrated, more or less consciously, in the research of several artistic groups. It stood out as a way to enlarge, broaden and open up the artwork itself, a way to free it from its former limitations so as to reach an unprecedented form. Umberto Eco promptly registered this phenomenon by introducing the notion of ‘open work’ (Opera aperta), not one, but a cluster of poetics which shared structural features, such as the ‘open’ interpretation, or even execution, of the artwork; the state of indefiniteness; the meta-artistic reflections. Elements which represented «the repercussion, in the formative activity, of specific acquisitions from contemporary scientific methodologies». In particular, these acquisitions took on a generative value meant to counteract the utter destruction brought about by the war. Art, then, had to enact people’s need for palingenesis. 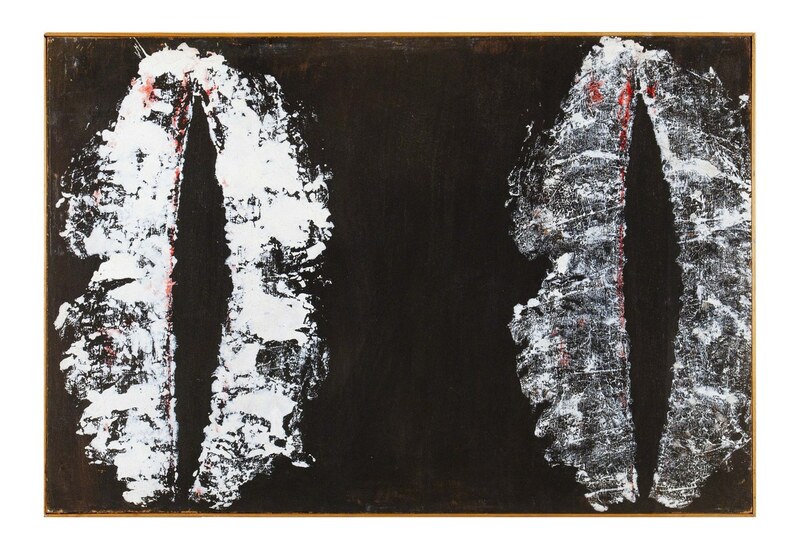 When in 1946, from Buenos Aires, Lucio Fontana launched his Manifiesto blanco which represented the birth act of Spatialism, the world had just emerged from its last and most dreadful bloodbath and it had witnessed, half astonished and half aghast, the inauguration of the so called atomic age. The youth who, animated by Fontana, designed and signed that manifest believed in an utter palingenesis of the art, by that time disanchored from the humiliating limits of naturalism, freed from the millenarian anthropomorphic myth and from the traditional modules, and finally liberated from terrestrial parameters. Just like Einsteinian relativity, the new quantum physics, and the dissociation of the atom had amplified, moved and finally subverted the old order of Euclidean physics, they believed that, inevitably and in the same manner, the world of representation and expression, namely the world of art, had to undergo more than just a radical renewal, but really a new birth. After several millennia of analytical development in the arts, the moment has come for the synthesis. At first separation was necessary. Today it constitutes a disintegration of the understood unity. We conceive synthesis as a sum of physical elements: colour, sound, movement, time, space, which integrate a physic-psychic unity. Colour, the element of space, sound, the element of time, movement which develops in time and space, are the fundamental forms of the new art, which contains the four dimensions of existence. Time and space. Fontana’s challenge was that of bringing several dimensions into the same artwork, thus surpassing the fixity of the canvas. As a consequence, materiality ceased to represent a passive tool in the hands of the artist and it became a source of potential energy. The artwork had to maintain that same energetic potential even in its form, it had to be dynamic, swarming alive with its emanation. 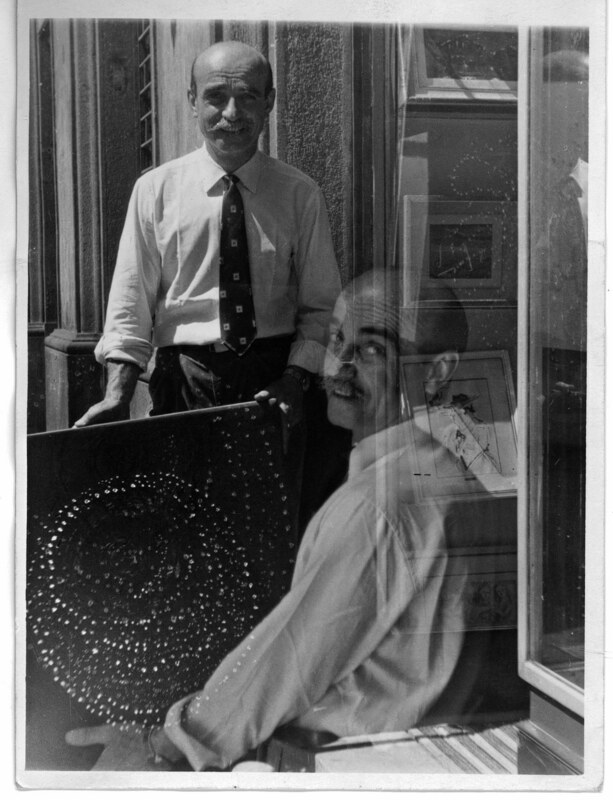 An attempt at achieving such a goal was made by Fontana in 1949 when, for the first time, he physically intervened on the canvases by piercing them and making holes in what he called his Buchi series; he later went on to cut deep slashes, or Tagli, on the monochrome surface of the paintings. The dynamic gestures, the twisting and lacerations, were meant to deform the plane and two-dimensional surface of the canvas. The artwork was thus brought to motion through shadows and ruggedness, while its cracks and breaks stood as a prelude to empty space. Holes, slashes and scratches were successful in displacing the work from its traditional frame, giving depth to new dimensions and opening up the piece to different possible meanings. It was a quest to go beyond matter in an adventure which echoed that of the spatial conquering of the universe and of the macrocosm. As a matter of fact, through the piercing, Fontana sought to open «a space, a new dimension in the tendency of contemporary art: the end of sculpture or of a tradition of easel-painting; but also a new dimension of the cosmos». The ultimate opening of matter to a space-time dimension was fully achieved, according to Francesca Alinovi (1983), by Fontana’s neon-light environments, exhibited since 1951. Fontana believed that «matter [was] a pretext to contain light», as he wrote in a letter to Giò Ponti. His work Luce spaziale (Spatial light), the first artificial luminescent installation designed together with architect Luciano Baldessari for the 1951 Triennale in Milan, created a multidimensional space, shared both by the artwork and by the observer. It will be possible to speak of spatial art only after the conquering of the fourth dimension in space: the flight… flight creates the fourth dimension, the detaching of man from the earth, form the line of the horizon which had been, for millennia, the basis for man’s aesthetics and proportions. A new aesthetics affirms luminous forms through spaces and within spaces. Time space. Light was therefore conceived as a source of space-time energy which could be released through the artwork; and one of the neon-light environments of 1961 was indeed titled Fonti di energia (Energy sources). 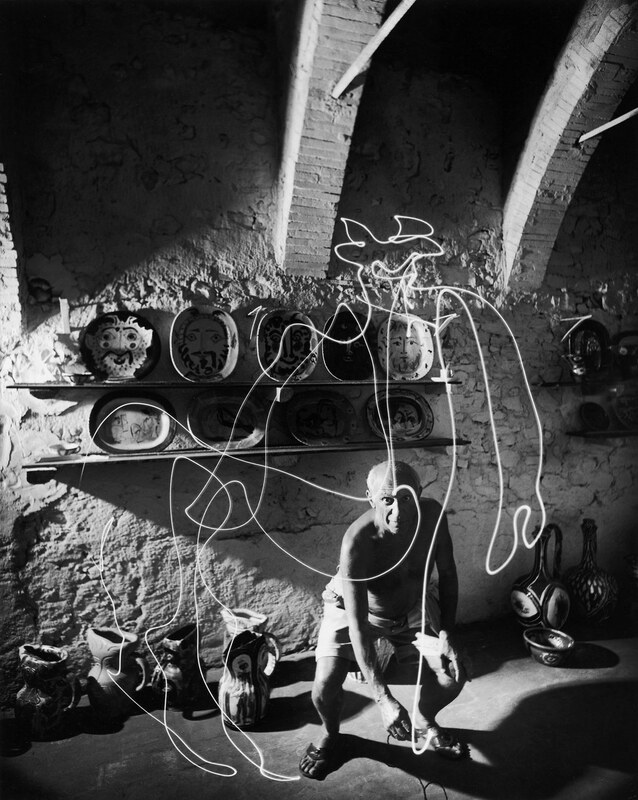 It will not be too surprising, then, to discover that the neon environments had been inspired by a photograph of Pablo Picasso, published in 1950 on the magazine AZ: arte d’oggi. 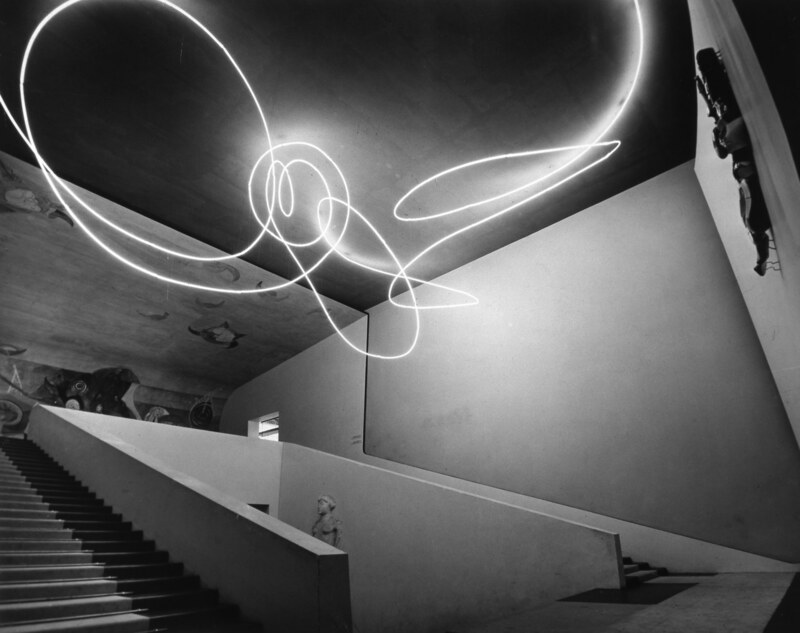 In the image, obtained through long-exposure, the famous painter traced some stringy and luminous forms in the air using a source of light. Through photography (literally ‘writing with light’) it was possible to really ‘see’ the pathway travelled by light, which was astoundingly impressed in space and time. The intertwined neon works were then a tribute to the traces of light and to light’s gestures, which ultimately embodied that tetradimensional art Fontana had so longed for. Like Fontana’s, the visual work of painter and poet Toti Scialoja was also concerned with a tetradimensional, space-time type of art, while at the same time evoking photography and the concept of ‘trace’. What Fontana and Scialoja had in common, artistically speaking, was the interest in discovering and then exposing to the public a further dimension, able to transcend both traditional form and matter. Even though the formal solutions they came up with belong to different artistic movements (i.e. Spatialism and Informel), a shared quest for a time-space continuum within the artwork lied at the core of their research; a quest that furthermore constituted a collective concern for the artistic community at large, including visual artists and writers alike. For this very reason, a cross analysis of Scialoja’s visual and literary work provides a rare opportunity to see how the reflections and thoughts, hence the poetics, which are at the basis of his painting also permeate in his writing research, though with different declinations. A compared analysis of Scialoja’s painting and poetry has been attempted, among the others, by Francesco Galluzzi who identifies, as a linking concept between the two disciplines, the notion of smemoratezza (‘forgetfulness’). Even though Galluzzi argues that the state of ‘forgetfulness’ takes on different realizations in painting or poetry, what seems most interesting for the purpose of this analysis is that Scialoja also linked ‘forgetfulness’ to the concept of space-time. In both art forms the artist tried to reach a primordial dimension (being that of humanity or of personal experience, i.e. childhood), so as to re-enact the far and forgotten past in the present of the artwork. The concept of space-time was used, like in Fontana’s case, as a way to elude the ordinary dimensions of traditional art, or of life itself; if Fontana had tried to go beyond matter in the virtual space of the universe, Scialoja’s longed dimension was that of primordial existence. The idea of ‘trace’ is illustrative of this quest. In 1956, after having abandoned cubism to embrace abstract research, Scialoja ‘discovered’ his first Impronte, figures produced by impressing on the canvas thick and dense materials either by hand or using a cloth imbued with colour. If on the one hand the trace existed (and was presently perceived) in the space of the painting, on the other hand it also incorporated a time dimension, being it an imprint produced in a specific moment of the past. The imprint stood as evidence of a physical contact occurred within time, which was, in turn, the result of a movement, therefore of a ‘gesture’: «born as physicality through contact, it remains there, germinated and inextricable, lid and seed, matrix and negative, evidence and grain of inviolability». The gesture was, for Scialoja, «the everything» as it was able to generate «a defined and animated nucleus of perception: a meeting point and a lightened time, mutually manifest and creative, between gesture and all converted matter». The imprint was both «manifest and creative», both recording and exposure. It was a phenomenological stance for which the subject came to terms with the outer world; used as pictorial technique it could also be seen, borrowing Merleau-Ponty’s words, as a «technique of the body» which, as such, «represented and amplified the metaphysical structure of our flesh». the spatial vision of painting shall be the vision of this feeling and pure necessity which is time, determined in its two poles of absolute identity of the subject with the imprint and of the inexorability of its occurrence as repetition. Repetition, perpetually renewed and perpetually modified is the visual symbol of such pure feeling which is the subjective-flux of each live expressed yet invisible. The imprint and its modified repetition became metaphorical for the human race in its entirety, with its incessant renewal and modification, with its constant coming to life and going through death; the subject being at once unique and inessential, at once present and past. where it is dark and warm. the journey in space and time allows for a double reading; on the one hand ‘under your skirts’ indicates a physical place (in its literal sense), on the other hand it also stands for the metaphorical space of the mother’s «dark and warm» womb, a possibility here reinforced by the symbolic value of the egg and by the figurative birth of the new year. For Scialoja, in fact, «the word of the poem exists in this spatiality and temporality of origin» which furthermore implies that «its acoustics is rustling, a buzz which contains the potential of all sound; it is germinating acoustics, swarming with virtuality». The poem, and language as well, almost become ‘environments’ to inhabit, «language is a country to inhabit», and consequently the poem is conceived as a «syllabic organization which establishes a place, labyrinth, garden, paradise-hell». For Scialoja the poetic word functioned as a place, which materialized and acquired body through the process of articulation and phonation. «If you are sea-sick chew on some gum». Scialoja acted on the word material, he distorted, decomposed and recomposed it to obtain unexpected results. When describing the relationship between painting-making and poetry-making he concluded that in both disciplines he operated within a field of potential meanings, «taking action in the unknown». Gesture was conceived as both ‘intentional’, as it was generated by the creative will of the author, and ‘unintentional’, since it had origin in an unknown dimension. Poetry and painting shared this same gestural nature; the poetic text itself was the result of an «unforeseen and fast strike of the hand with two or three words» which determined a nonsense through an «unintentional act». Scialoja’s nonsense was reminiscent of Lewis Carroll’s and James Joyce’s and it occupied the page with its mythical and enigmatic form. «Nonsense – like Gilles Deleuze brilliantly clarified – is not the lack of meaning, but rather an excess of it, that which gives meaning to both the signifier and the signified. Meaning here results from the functioning of the structure, in the movement between the serial components». Meaning, then, remained open to interpretation, it was layered and complex, directly stemming from the mobile structure of the text. With no need to further quote from Eco’s Opera aperta, it might be interesting to note how both painting and poetry maintained that sense of indefiniteness and potentiality which characterized not only Scialoja’s work, but the artistic research of many writers and visual artists active in the 1950’s and 1960’s. In the writing scene particularly, Renato Barilli identified a new trend of linguistic experimentation emerging in those decades. Carroll and Joyce were again the literary fathers of such phenomenon, which the critic, in his book Viaggio al termine della parola (1981), defined as «intra-verbal research». The linguistic research reached a sub-atomic stratum of the word, which underwent fractures, segmentations, paronomastic torsions, stuttering syllabifications, morphological deformations. The acoustic components were attracted to one another and bound by auditory gravity; words came together through omophonic suggestions giving birth to neologisms or portmanteaus. According to Barilli, this new approach to the poetic word was formulated in response to three different factors; it firstly stemmed from Saussure’s early century linguistics developments, which separated the signified from the acoustic materiality of the signifier; secondly, it resented of the psychopathologic research carried out by Sigmund Freud, who linked humour to lapsus; finally it was influenced by scientific and technologic innovations, such as the emerging of acoustical physics and the development of sound recording and analysis machines, for which sound became more interesting than meaning, and could evolve into noise. Even though Barilli fails to explicitly mention Einstein relativity and non-Euclidean geometry, it is evident that these, too, have contributed to the unrolling of the intra-verbal research throughout the century – and it would be easy to link some post-war experimental writing, in which the unity of the word appears intentionally fractured and disintegrated, to the aftermath of the nuclear bombing. Barilli, on the other hand, cites Joyce as the greatest example, and as the forerunner, of the intra-verbal research; interestingly, Eco’s Opera aperta was profoundly inspired by Joyce’s poetics and it was initially conceived as an analysis of this author’s work. Donald F. Theall, in the book James Joyce’s Techno-poetics (and more specifically in the two chapters entitled The Rhytmatick of Our Eternal Geomater and The New Techno-Culture of Space-Time), investigates the multiple references, that Joyce made both in Ulysses and in Finnegans Wake, to non-euclidean geometry, to Einstein and to the concept of space-time. It is then possible to argue that intra-verbal research, widely spread in post-war Italy, was also innerly dealing with matters of space-time; furthermore, intra-verbal research can be easily included in the macropoetics of the Open work, since the deformations and alterations exerted on words determined a surplus of potential meanings, allusions that called for the reader’s intervention to recreate their personal understanding of the text. Amelia Rosselli’s early trilingual writing (1952-1963) shares with Scialoja’s the constructive and generative experimentation with micro-sounds and syllabications while at the same time offering further evidence of a research closely dealing with issues of space-time, which constituted a structural feature of both Scialoja and Fontana’s art making. Highly influenced by James Joyce’s work, Rosselli particularly sought to recreate a space-time reality in her art by investigating and by stretching the possibilities offered by language. Furthermore, the concept of space-time and of a tetradimensional reality not only was reflected in Rosselli’s linguistic experimentation, but it also contributed to the shaping of her own metric system, which she referred to as Spazi metrici (Metric spaces), a notion directly borrowed from mathematics. The analysis of this last author’s poetics can then serve to further reveal how scientific matters, and the space-time concept in particular, actively stimulated and propelled the artistic research of post-war Italian artists, among which Scialoja and Fontana stand out. I went back to my five classifications; letter, syllable, word, sentence and period. I framed them within an absolute space-time. My verses could not escape the universality of the unique space; the length and time of the verses were established in advance, my organizational unit was determinable, rhythms adapted not only to my will, but also to the pre-planned space, and this space was entirely covered by experiences, realities, objects and sensations. By transferring the rhythmical complexities of written and imagined, but unspoken, language, through a copious varying of timbric and rhythmic particles within a single and limited typical space, my meter, if not regular, was at least total; all possible and imaginable rhythms carefully covered my square with its timbric depth, my rhythm was musical as much as the latest post-webernist experiments, my regularity, when present, was contrasted by a swarming of rhythms which were not translatable in feet or in short or long measures, but in microscopic durations, which could be hardly marked, if one wanted to, with a pencil on graph paper. to that understood language which makes love stay. I started, at one point of my teenage years, to look for universal forms. To find them I firstly searched for my (western and rational) minimal element of organization in writing. And this clearly resulted to be the letter, either acoustic or not, timbric or not, typographic or formal, symbolic and functional at the same time. child who regains memory as a loaf of bread is turned is child with no childhood. Fotos of places are better than places or memories, fotos in our brain same ways. Curve the triangle out of escape and the landscape into curved belonging. Rosselli’s metric system can then be defined as a geo-metrics, measuring both space and time; a system that in a certain sense resembled photography, as it was designed to record processes and experiences, that is, to capture a given moment in space and time. In the transfer from the space-time of reality to the tetradimensional one of poetry a deforming contraction took place; a threshold which made it possible to glimpse the gap between biographical and collective, between the language of the individual and universal language. The concept of space-time – and of tetradimensionality – constitutes a prominent and shared feature in the shaping of these three artists’ poetics. The possibility to embed a new dimension in the artwork seemed to comply with the wish to elude the fixity of either the canvas or the page, while conferring dynamicity to the artwork. This dynamicity was what allowed the artwork to emanate and project out a further spatiality, being it physical, like in Fontana’s ‘walkable’ environments; or conceptual, like for the time-travelling dimension emanating from both Scialoja’s paintings and poems, or for the tetradimensional cube-constructs which encaged Rosselli’s experience. In all three cases, the tetradimensional time-space concept was implemented to ‘experiment’ and, particularly, to slowly push art out of its traditional boundaries, in a process which was soon to become programmatic and which led to intermediality in the arts, like for example in kinetic installations, in visual and acoustic poetry, or in performances. The need for a new kind of art reflected the changed cultural, philosophical and scientific panorama of post-war Italy which had universally experienced that ‘rupture between progress and progression’ the war had made apparent and which finally appeared to be complex, multi-layered and rhizomatic. 1 In L. Caramel, Arte in Italia 1945-1960, Milano, Vita e Pensiero, 1994, p. 130: «Ci rifiutiamo di pensare che scienza ed arte siano due fatti distinti, che cioè i gesti compiuti da una delle due attività possano non appartenere anche all’altra. Gli artisti anticipiano gesti scientifici, i gesti scientifici provocano sempre gesti artistici». This and all following translations are carried out by the author of this paper. 2 See N. K. Hayles, Chaos Bound: Orderly Disorder in Contemporary Literature and Science, Ithaca, Cornell University Press, 1990, and Ead. (ed. ), Chaos and Order. Complex Dynamics in Literature and Science, Chicago, The University of Chicago Press, 1991; E. Morin, Introduzione al pensiero complesso, Milano, Sperling & Kupfer, 1990; P. Antonello, Il ménage a quattro (Scienza, filosofia, tecnica nella letteratura italiana del Novecento), Firenze, Le Monnier, 2005. 3 This is how Edoardo Sanguineti refers to the avant-garde movements, both in his Poesia informale? (now in R. Barilli, A. Guglielmi (ed. ), Gruppo 63. Critica e teoria, Milano, Feltrinelli, 1976) and in his E. Sanguineti, Per una critica dell’avanguardia poetica in Italia e in Francia, Torino, Bollati Boringhieri, 1995. 4 For an overview of the shift in perceiving time and space in the early Twentieth Century see S. Kern, The Culture of Time and Space, 1880-1918, Cambridge, Harvard University Press, 2003. 5 U. Eco, Opera aperta, Milano, Bompiani, 2013. 6 As Claudio Spadoni cleverly points out in his L’immediato dopoguerra e l’uscita dall’autarchia, in R. Barilli et al., L’arte in Italia nel secondo dopoguerra, Bologna, Il Mulino, 1979. On the same topic see also M. De Micheli, ‘Realism and the Post-war Debate’, in E. Braun (ed. ), Italian Art in the 20th Century, Painting and Sculpture 1900-1988, Munich, Prestel-Verlag, 1989. 7 For a document on the transnational influences which helped shaping Il gesto see M. Nicholls, A. White, ‘Il gesto: Global Art and Italian Gesture Painting in the 1950s’, Humanities Research, vol. 19, 2, (2013), pp. 81-97. 8 On Sanguineti and his relationship with visual arts see T. Lisa, Pretesti ecfrastici. Edoardo Sanguineti e alcuni artisti italiani, Firenze, Società Editrice Fiorentina, 2004; and also P. Chirumbolo, ‘Signs and Designs: Sanguineti and Baj from Laborintus to The Biggest Art-Book in the World’, in P. Chirumbolo, M. Moroni, L. Somigli (ed. ), Neoavanguardia. Italian Experimental Literature and Arts in the 1960s, Toronto, University of Toronto Press, 2010, pp. 233-253. 9 An anthology of texts by Gruppo 63 can be found in N. Balestrini, A. Giuliani (ed. ), Gruppo 63. L’antologia, Torino, Testo & Immagine, 2002. 10 Dorfles advocated for a compared investigation of different art forms in the first issue of the journal: «I rapporti tra le singole arti [...] avrebbero bisogno d’esser sviscerati ed approfonditi [...]. Ho già accennato altre volte a certo parallelismo, facilmente esemplificabile, tra l’evoluzione del linguaggio musicale (dal modalismo al tonalismo, da questo alla dodecafonia, attraverso le tappe del politonalismo e dell’atonalismo) un’analoga evoluzione del linguaggio pittorico (dalla bidimensionalità alla tridimensionalità prospettica, alla riconquista di una cromaticità di superficie, attraverso lo sviluppo del colore da tonale a timbrico). Ritengo ora che anche nelle arti della parola, un’indagine di tal fatta [...] sia da sviluppare e approfondire. Pochi studi sono stati rivolti, ad esempio, alla sonorità e ritmicità della parola e del suono, alla composizione spaziale del poema e del dipinto, all’intervallo, in musica e nella plastica, e via dicendo» (G. Dorfles, ‘La letteratura e le arti’, Aut-Aut, 1 (1951), p. 49). 11 The term refers to Kuhn’s work, as in T. S. Kuhn, The Structure of Scientific Revolutions, Chicago, Chicago University Press, 1962. 12 V. Somenzi, ‘Relatività e fisica nucleare’, Aut-Aut, 1 (1951), p. 72. 13 B. Westphal, Geocritica: reale finzione spazio, Roma, Armando, 2009, p. 22. 15 Even though it would be interesting to analyse the influence of this epistemological concept on a broader scale, here I will focus on the authors mentioned. Of course, Fontana influenced much of the visual research from the 1950’s onwards. It is also interesting to note that in the first issue of Aut-Aut, which I already had the chance to mention, composer Luigi Dallapiccola wrote about the fourth dimension of time in music in ‘Sulla storia della dodecafonia’, Aut-Aut, 1, 1951, pp. 30-45. 16 And here Eco refers to the aesthetics of Luigi Pareyson: L. Pareyson, Estetica: teoria della formatività, Torino, Edizioni di filosofia, 1954. 17 U. Eco, Opera aperta, p. 159. 18 A. García, Fontana, Milano, La Prora, 1953, p. 263. 19 ‘Manifiesto blanco’, Buenos Aires, 1946, in L. Fontana, Fontana: mostra Firenze, palazzo Pitti, aprile-giugno 1980, Firenze, Vallecchi, 1980. 20 This idea of total art spread endemically and became mainstream from 1960’s on. In the poetry scene see Adriano Spatola’s pseudo-manifest, A. Spatola, Verso la poesia totale, http://www.archiviomauriziospatola.com/prod/pdf_protagonisti/P00242.pdf [accessed 15 June 2016]. 21 ‘Primo Manifesto dello Spazialismo’, Milano, 1947, in L. Caramel, Arte in Italia 1945-1960, p. 130, my italics: «Passati vari millenni di sviluppo artistico analitico, giunge il momento della sintesi. Prima la separazione fu necessaria. Oggi costituisce una disintegrazione dell’unità concepita. Concepiamo la sintesi come una somma di elementi fisici: colore, suono, movimento, tempo, spazio, la quale integri una unità fisico-psichica. Colore, l’elemento dello spazio, suono, l’elemento del tempo, il movimento che si sviluppa nel tempo e nello spazio, sono le forme fondamentali dell’arte nuova, che contiene le quattro dimensioni dell’esistenza. Tempo e spazio». 22 B. Hess, Lucio Fontana, Milano, Taschen, 2006, p. 8. 23 F. Alinovi, ‘Spaziali e nucleari. L’informe abnorme’, in R. Barilli, F. Solmi (ed. ), L’informale in Italia. Mostra dedicata a Francesco Arcangeli, Milano, Mazzotta, 1983. See also F. Alinovi, ‘La crisi dell’opera e il progetto di superamento dell’arte negli anni ’50’, in R. Barilli et al., L’arte in Italia nel secondo dopoguerra, pp. 53-87. 24 B. Hess, Lucio Fontana, p. 82. 25 F. Alinovi, ‘Spaziali e nucleari. L’informe abnorme’, in R. Barilli, F. Solmi (ed. ), L’informale in Italia. Mostra dedicata a Francesco Arcangeli, p. 36: «Si parlerà di arte spaziale solo con la conquista della quarta dimensione nello spazio: il volo [...] il volo crea la quarta dimensione, il distacco dell’uomo dalla terra, dalla linea d’orizzonte che per millenni fu la base della sua estetica e proporzioni. Una nuova estetica afferma forme luminose attraverso gli spazi e dentro gli spazi. Tempo spazio». 26 Another interesting contribution, in which Scialoja’s work is taken to exemplify the concept of the ‘sguardo-evento’ (event-look), can be found in R. Donati, Nella palpebra interna. Percorsi novecenteschi tra poesia e arti della visione, Firenze, Le Lettere, 2014, pp. 34-66. 27 F. Galluzzi, ‘Il ritmo del corpo. Pittura e scrittura in Toti Scialoja’, Italianistica: Rivista di letteratura italiana, vol. 29, 3 (2000), pp. 451-459. 28 Note the use of the words ‘negative’ and ‘evidence’, which are evocative of photography, in T. Scialoja, Giornale di pittura, Roma, Editori riuniti, 1991, p. 127, italics of the author. 30 M. Merleau-Ponty, L’occhio e lo spirito, Milano, SE, 1989, p. 27. 31 For a definition of the Informel movement and for its general understanding see R. Barilli, L’informale e altri studi di arte contemporanea, Milano, All’insegna del pesce d’oro, 1964; G. Dorfles, Ultime tendenze nell’arte d’oggi. Dall’Informale al Neo-oggettuale, Milano, Feltrinelli, 1999; and see also the monographic issue of il verri dedicated to Informel, L. Anceschi (ed. ), il verri, 3 (June 1961). 32 U. Eco, Opera aperta, p. 124. 34 T. Scialoja, Giornale di pittura, p. 113, my italics: «la visione spaziale della pittura sarà visione di questo sentimento e necessità pura che è il tempo, determinata nei due poli della identità assoluta del soggetto come impronta e nella inarrestabilità del suo attuarsi come ripetizione. La ripetizione perennemente rinnovata e perennemente modificata è il simbolo visuale di tale sentimento puro che è la soggettività-fluenza di ogni vita espressa-invisibile». 35 «The space time that I call childhood» (Id., ‘Come nascono le mie poesie’, il verri, 8 (1988), p. 13). 36 Id., La mela di Amleto, Milano, Garzanti, 1984, p. 119: «Mi farò per l’autunno / una cuccia di cane / fino alla fin dell’anno / sotto le tue sottane. // Ci sorbiremo un uovo / il primo di gennaio / poi tornerò di nuovo / dove fa caldo e buio». 37 Id., ‘Come nascono le mie poesie’, p. 13. 39 Id., La mela di Amleto, p. 19: «Una libellula / mi canterella: / “Trallerallibe / trallerallulla [...]”». 40 Id., ‘Come nascono le mie poesie’, p. 10. 41 Id., La mela di Amleto, p. 14: «Sotto un ace / ro il rinoce / benché lace / ro e di pece / dorme in pace. / Sotto un noce / ch’è di fronte / ronfa il ronte». 42 Id., ‘Come nascono le mie poesie’, p. 12. 43 Ibidem: «Ecco allora come può nascere una mia poesia: prendiamo la parola ‘zanzara’. Quella voglia di cui ho detto mi fa compiere alcune azioni su questa parola. La prima è la più semplice, sillabarla: zan-za-ra. La parola si disfa, mi sfugge. La sillabo diversamente, mangiandomi la coda. Zanza-zara. Le cose vanno meglio. Zanza non vuol dire niente, ma Zara sì. Zanza, d’altronde, somiglia moltissimo a zonzo. (Per il Tommaseo la voce zonzo deriverebbe proprio dal ronzio delle zanzare che vanno a spasso). È naturale, quindi, che la zanzara vada a zonzo per Zara. Ma perché la piccola Zara sull’Adriatico e non la più zanzarosa Zanzibar sull’Oceano Indiano? Andando sempre a zonzo si diventa zuzzurelloni e si finisce in un bar. Una rapida adulterazione di vocali trasforma la zanzara in zenzero, ottimo rimedio contro la nausea alcolica. La poesia è completata: Una zanzara di Zanzibar / Andava a zonzo, entrò in un bar, / ‘Zuzzurellona!’ le disse un tal / ‘mastica zenzero se hai mal di mar’». 45 To know more about Scialoja’s relationship with the tradition of nonsense of Lewis Carroll and Edward Lear see A. Giammei, Nell’officina del nonsense di Toti Scialoja. Topi, toponimi, tropi, cronotopi, Milano, Edizioni del verri, 2014. On Scialoja see also Eloisa Morra: E. Morra, Un allegro fischiettare nelle tenebre. Ritratto di Toti Scialoja, Macerata, Quodlibet Studio, 2014. 46 G. Deleuze, Lo strutturalismo, Milano, SE, 2004, p. 50. 47 It would be interesting to linger more on the way Joyce incorporated recent scientific revolutions in his writing. To quickly sum it up Eco’s words prove again to be effective: «In Finnegans Wake we are really facing an Einsteinian cosmos, folded onto itself – the initial word welding to the last one – and therefore finite, though for this reason infinite. Each event, each word, stands in a potential relation to any other and it is through the semantic choice made about an element that the sense of the others is determined» (U. Eco, Opera aperta, p. 43). 48 For example in the work of Andrea Zanzotto, Edoardo Sanguineti, Antonio Porta, Nanni Balestrini and of course of Toti Scialoja and Amelia Rosselli. 49 For an overview of Rosselli’s work see S. Giovannuzzi (ed. ), L’opera poetica, Milano, Mondadori, 2012 and A. Cortellessa (ed. ), La furia dei venti contrari: Variazioni Amelia Rosselli con testi inediti e dispersi dell’autrice, Firenze, Le Lettere, 2007. 50 In A. Rosselli, L’opera poetica, Milano, Mondadori, 2009, p. 125. 51 In her book (F. Fusco, Amelia Rosselli, Palermo, Palumbo, 2007), Fusco resorts to the metaphor of vectors and forces to analyse the poet’s work. 52 A. Rosselli, Spazi metrici, in Ead., L’opera poetica, pp. 337-342. 53 Ead., L’opera poetica, p. 102. 54 In her Diario in tre lingue (1955-1956) Rosselli wrote: «time in poetry becomes volume of the cube; i.e. depth through the space-expectation between verses» (Ead., L’opera poetica, p. 104). 55 See S. Colangelo, Metrica come composizione, Bologna, Gedit, 2002. Scholarly works have often discussed Rosselli’s interest in music by focusing on her research in musicology and composition, as in S. Sgravicchia, ‘Gli armonici di Amelia Rosselli’, in D. Scarpa (ed. ), Atlante della letteratura italiana, Torino, Einaudi, 2012, pp. 831-835. Though Rosselli’s studies and attendance at Darmstadt need to be taken into consideration, it is also true that an interdisciplinary comparison among poetics was typical of post-war experimental research. See for example F. Mussgnug, ‘Writing Like Music: Luciano Berio, Umberto Eco and the New Avant-Garde’, Comparative Critical Studies, vol. 5, 1 (2008), pp. 81-97; and also P. Somigli, ‘Gruppo 63 and Music: a Complex Relationship’, in P. Chirumbolo, M. Moroni, L. Somigli (ed. ), Neoavanguardia. Italian Experimental Literature and Arts in the 1960s, pp. 254-282. 56 A. Rosselli, Spazi metrici, p. 340, my italics: «Ripresi in mano le mie cinque classificazioni: lettera, sillaba, parola, frase e periodo. Le inquadrai in uno spazio-tempo assoluto. I miei versi non potevano più scampare all’universalità dello spazio unico: le lunghezze ed i tempi dei versi erano prestabiliti, la mia unità organizzativa era definibile, i miei ritmi si adattavano non ad un mio volere soltanto ma allo spazio già deciso, e questo spazio era del tutto ricoperto di esperienze, realtà, oggetti e sensazioni. Trasponendo la complessità ritmica della lingua parlata e pensata ma non scandita, tramite un numerosissimo variare di particelle timbriche e ritmiche entro un unico e limitato spazio tipico, la mia metrica se non regolare era almeno totale: tutti i ritmi possibili immaginabili riempivano minuziosamente il mio quadrato a profondità timbrica, la mia ritmica era musicale fino agli ultimi esperimenti del post-webernismo, la mia regolarità, quando esistente, era contrastata da un formicolio di ritmi traducibili non in piedi o in misure lunghe o corte, ma in durate microscopiche appena appena annotabili, volendo, a matita su carta grafica millesimale». 57 Ead., L’opera poetica, p. 191: «I rapporti più armoniosi e i rapporti più dissonanti [...] / [...] voglia io unirvi / in un universo sì cangiante sì terribilmente dissidente / che solo la gloria di Dio noi crediamo porti gloria / sa riunire». 58 Cfr. Ead., Spazi metrici, p. 338: «the language in which I write each and every time is only one, whereas my acoustic logic and associative experience is definitely that of all people and reflected in all languages». 59 Ead., L’opera poetica, p. 174: «O sei muiei / conigli correnti peri nervu ei per / brimosi canali dei la mia linfa (o vita!) / [...] trova queia Parola Soave, tu ritorna / alla compresa favella che fa sì che l’amore resta». 60 On the concept of lapsus as a way to carry out linguistic experimentation, and for a possible link to the tradition of nonsense, already mentioned for Scialoja, see Emanuela Tandello’s article on the monographic issue of Trasparenze, entirely dedicated to Amelia Rosselli: E. Tandello, ‘Alle fonti del lapsus: pun, portmanteau, wordscape. Appunti sull’inglese letterario di Amelia Rosselli’, Trasparenze, 17 (2003), pp. 173-192. 61 Yet another understanding of Rosselli’s linguistic experiments, halfway between Pasolini’s argument and the one here discussed (see P.P. Pasolini, ‘Notizia su Amelia Rosselli’, Il Menabò, 6 (1963), pp. 66-69), is provided by Alberto Casadei who argues that the associations made by Rosselli result from a negotiation between a «conscious need to express her own suffering and a surfacing of unconscious states» (A. Casadei, ‘Amelia Rosselli dopo le Variazioni: analisi e appunti di metodo’, Forum Italicum: A Journal of Italian Studies, vol. 44, 1 (2010), pp. 81-96). For a cognitive approach to Rosselli’s work see also Id., Poetiche della creatività. Letteratura e scienze della mente, Milano, Mondadori, 2011. 62 A. Rosselli, L’opera poetica, p. 338: «io mi misi a un certo punto della mia adolescenza a cercare le forme universali. Per trovare queste cercai da prima il mio (occidentale e razionale) elemento organizzativo minimo nello scrivere. E questo risultava chiaramente essere la lettera, sonora o no, timbrica o no, grafica o formale, simbolica e funzionale insieme». 63 On the deforming mechanism of ‘taming’ implement by Rosselli, see E. Carletti (2015), ‘Il chiarore che deforma – Processi deformanti nella poetica di Amelia Rosselli’, altrelettere, 16 January 2015, [accessed 9 October 2015]. 64 A. Rosselli, L’opera poetica, p. 125.